Provide comfort for the family of Edward Rose with a meaningful gesture of sympathy. Ed was a son of the late Peter A. and Nancy (Torsell) Rose. He was born and lived his entire life in Pleasant Gap. He is survived by his wife of almost 59 years, Nancy (Beightol) Rose, daughters Tina Wendt (Gregory) of Bellefonte and Lori of Pennsburg, and son Brian (Deborah) of Mechanicsburg. Ed is also survived by grandchildren Brianna and Allena Wendt, Dominic, Dante and Olivia Rose, sister Elizabeth Saussaman, mother-in-law Pauline Beightol, and many beloved nieces, nephews, sisters-in-law and extended family. He was preceded in death by daughter Kimberly Ann, siblings Anthony, Peter Jr., John, Joseph, Mary DeBrasky, Angelo, James, Carmen, Frank, Rosalie, Robert, Lewis, and father-in-law Eugene Beightol. Ed was a 1950 graduate of Bellefonte High School, and a 1956 graduate of the Philadelphia Institute of Barbering. In the interim, he enlisted and served his country as a PFC in the United States Army. His time with the 1st Cavalry during the Korean War was spent in Japan. After serving his country, he was employed as a Block and Brick Layer by Gene Markle Construction. He began his 60-year career as a barber at Kennedy’s Barber Shop, before becoming owner of Rose’s Barber Shop until his retirement in 2015. His barber shop was not just a place for haircuts, but also the place locals gathered for conversation and friendship. Ed was a life-long member of St. John the Evangelist Catholic Church, Bellefonte. He loved his community and served its residents in a variety of roles. He was a lifetime post member and past commander of Houtz-Meyers-Rose American Legion Post 867, and also a lifetime member of both the Pleasant Gap Fire Company and Bellefonte Elks Club #1094. Ed was a charter member and treasurer of the Pleasant Gap Area Lions Club and served as an officer and long-time coach of the Pleasant Gap Little League. Friends were very important to Ed and he collected quite a few. He enjoyed spending time with them, whether golfing, hunting, playing poker or in any of his civic club activities. He was a sports enthusiast. In his younger years, he participated on a variety of local baseball, softball and bowling teams. He was an avid fan of the Pittsburgh Pirates, Steelers and Penguins, and the Penn State Wrestling Team. No team was closer to his heart than the Notre Dame Fighting Irish. Family was the most important part of his life. He loved attending the activities of his grandchildren and supporting them in their accomplishments. He looked forward to the annual family vacation in Bethany Beach, Delaware. His commitment to both his immediate and extended family knew no bounds. He was loved beyond measure. There will be a public viewing held on Thursday, April 11, 2019, from 6-8 PM, with a wake service following, at Wetzler Funeral Service, Inc. at 206 N. Spring Street, Bellefonte. Mass of Christian burial will be held on Friday, April 12, 2019, at 9 AM at St. John the Evangelist Catholic Church at 134 E. Bishop Street, Bellefonte with Father George Jakopac officiating. Burial with full military honors will immediately follow in St. John Catholic Cemetery in Bellefonte. For those wishing to honor his memory, donations can be made to St. John the Evangelist Catholic School, 116 E. Bishop St., Bellefonte, PA 16823 or St. John the Evangelist Catholic Church, 134 E Bishop St., Bellefonte, PA 16823. To send flowers in memory of Edward Phillip Rose, please visit our Heartfelt Sympathies Store. Wake service will immediately follow viewing and visitation. Tom Jenkins sent flowers to the family of Edward Phillip Rose. There aren't enough kind words to say about Ed or his family. We're going to miss our "porch buddy" now that the weather is nice. We're going to miss him driving by with a smile on his face because he's off on another ride! We loved him and it's going to be a big loss to the neighborhood! Nancy, Tina, Lori and Brian, our heart is also broken and our prayers are with you. Rest in Peace Ed, you will not be forgotten! I had the pleasure of making Ed's acquaintance through his son, Brian as we are neighbors. I am lucky to share many memories with his family sitting around a big table eating good food, telling stories and laughing together . I will always remember the devilish twinkle in his eyes with fondness. To Brian, Debbie, Dominic and Dante: Gods Blessings to your entire Family from your Brothers at That Man is You. 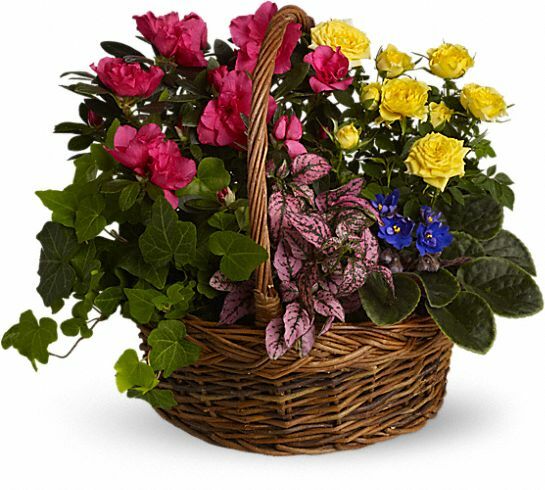 Tom Jenkins purchased the Blooming Garden Basket for the family of Edward Rose.